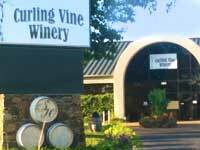 Curling Vine Winery – Taste the Fun! A must-see Branson attraction—just two blocks off the strip. A favorite stop for I-70 travelers, at the Hermann exit, halfway between St. Louis and Columbia. 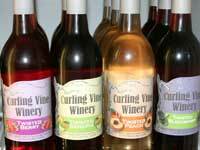 Now your favorite Curling Vine wines can be delivered to your door! How cool is that? Curling Vine owners Thomas and Andrea Held have a long history in the wine industry. Thomas actually grew up in a winery. In the 1960s, his parents, Jim and Betty Held, opened Stone Hill Winery in Hermann, bringing the long-dormant Missouri wine industry back to life. His first job at the winery, at age two, was slipping seals on bottles after they had been corked. Thomas attended the University of Arkansas and Fresno State in California, where he earned a degree in food science with a minor in enology and viticulture. When the Held family opened a Branson location, 23-year-old Thomas was chosen to oversee the operation. The Branson winery grew to be a huge success, helped along, says Thomas, by the School of Hard Knocks, the wisdom of his parents, and the support of the Branson business community. Andrea Held (that’s Andy’s picture above and on our billboards) started work at Stone Hill’s Branson location in 1987, first as a tour guide and later assistant manager. In 1998, when Thomas returned to Hermann, she took over as general manager. Thomas and Andrea were married in 2002. They settled in Hermann, working in the family business and raising six children. 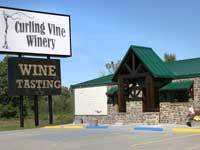 In 2016 they began a new chapter of the story, opening Stone Hill’s former Branson and New Florence locations as Curling Vine Winery.